McClure (population approximately 200) is located in Alexander County near Cape Girardeau, Missouri. McClure sits about a mile southeast of the Mississippi River on Illinois Route 3. The Old Prairie Creek flows through the center of McClure. The area was first settled in 1836 and a post office there was named "Clear Creek Landing". The town was later officially recognized and the name changed to "Wheatland" in 1887. The name of the town was changed to McClure in 1895 in honor of a man named J.T. McClure. 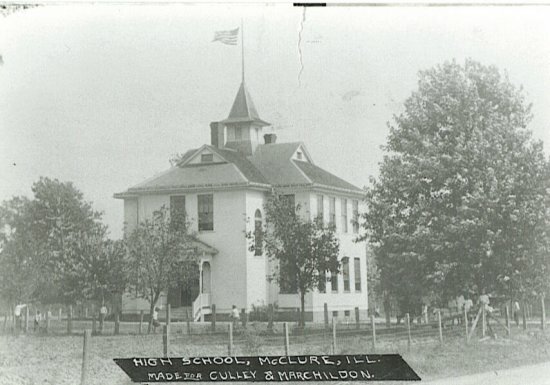 An interesting history of McClure High School can be viewed at the web address of http://www.shawneecc.edu/library/scans/mcclure1811-2.jpg . At one time, in the early 1900s, there were five country schools in this area: Cother, Round Pond, East Cape, McRaven and Gale that consolidated into the McClure School in 1920. This made the McClure School System a K-12 building. The school building, built in the early 1900's, had two rooms on two stories with four more rooms later added. 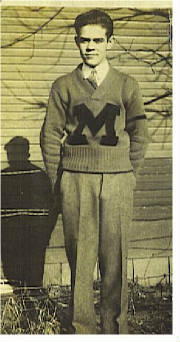 In 1938, McClure High School was built through an effort by the Public Works Administration (A Roosevelt "New Deal" organization). The school districts of McClure, Wolf Lake and Grand Tower consolidated around the mid-1950's into the Shawnee School District with the high school building located in Wolf Lake in Union County. McClure retained their building and was (or is?) used as a grade school. "My name is Brad McClure I would like to know if anyone has any thing left of the McClure High erray. If you do, please contact me through the IHSGD website crew at ihsgdwebsite@comcast.net .Thank You,"
McClure High School offered Basketball and possibly other sports. If you have any information about other sports offered at McClure High School, please drop us a line. We are also looking for seasons records, coaches names, team nickname, and school fight song. In Boys Basketball, MHS won two District Championships, which are listed below. 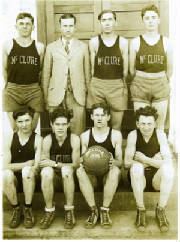 The photo to the right is of the McClure High School basketball team for the 1927-28 season. Lester Johnson, father of Margaret (Johnson) Stubbings, was a freshman and is the second boy from the left on the bottom row (just left of the boy holding the ball). None of the others are identified in the photo. Please contact us if you can identify them. Any further information regarding the McClure High School basketball program is welcome. Several scores from the IHSA State Tourney were located on a website titled "Illinois Postseason Basketball Scores" involving McClure High School. These scores are listed below. **Last time that McClure was listed on the website "Illinois Postseason Basketball Scores." The last basketball game of the season was with Wolf Lake Friday evening at the McClure gymnasium. The score was 27 to 11 in favor of McClure. Miller Sams was the referee. It was a good, snappy game, with a team where there are only eight boys in the high school and six of them play the game. Wolf Lake has no gymnasium, either. --Source: Cairo Evening Citizen and Bulletin, March 3, 1930, contributed by Anna Shelton. "We had a "cracker jack" of a baseball team. Mr. Ferd Glaab was our coach. We always delighted "beating up" on the Thebes, Wolf Lake, and Grand Tower baseball teams. They were our "arch" rivals like the St. Louis Cardinal and Chicago Cub "love affair." I was the McClure, "bullet arm" catcher and delighted throwing out a couple of the Grand Tower players. I think their names were Charles "speedy" Dickson and Gene "fast ball" Wills. You might check this out with them for verification of the facts. Often, as we become more "mature" we remember things "the way we want them to be" rather than the way they actually were." Thank you Cliff, for this light-hearted account of your days at McClure High.